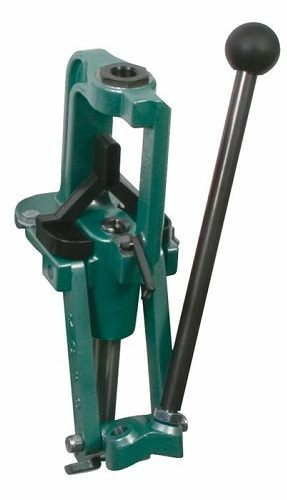 The RCBS Rock Chucker Supreme single-stage reloading press is one of the ​best reloading presses on the market​. They are built to last a lifetime. As soon as you press your first case, you’ll see for yourself. It's very simple and straightforward, with no extra bells and whistles. It was designed for one purpose and one purpose only, and that is forming cases and pressing bullets. It does this perfectly, and can continue to perform to the same standard of excellence through millions of pressed rounds. At a glance, you have a very sturdy pressing rim. This is encouraging, because it's arguably the most important part. Secondly, you'll notice the solid steel handle. It has a hefty weight to it, operates smooth as oil, and feels like it was built to be in your hand. Another great feature is that the handle is easily switched to accommodate both left and right-handed individuals. The outer body of the press is extremely sturdy and made of industrial grade cast iron. As far as the press itself goes, you have about four inches of clearance to work. This is more than enough space to handle just about any case you would use. Looking at the die choices, you can use the standard 7/8"-14 threaded dies. Or, you can remove the bushing and use 1-1/4"-12 threaded pitch dies if you’re looking to reload larger calibers such as a 577, 450 martini-henry, or a 50 BMG. 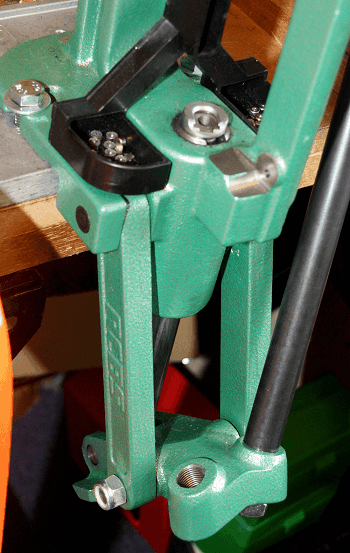 The priming arm has a simple design similar to many other single stage presses. It comes with both large and small priming cups which are very easy to change out, and there's even is a little catch for all your spent primers. The RCBS Supreme makes short work of casing almost any rounds. It was slightly harder to press the 50 BMG, but still remains almost effortless. 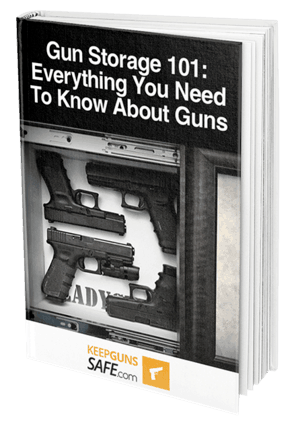 It makes pumping over a hundred rounds in thirty minutes an easy task. Mechanical advantage is one of the single most distinguishing features that set presses apart from each other. This one doesn't lack in that. The amount of mechanical advantage you get out of this machine is outstanding. Most customers choose to case their own rounds. This is because of the amount of money they can save in comparison to purchasing new ammunition every time they go shooting or hunting. Many people say they have easily pressed 1,000 cases in one sitting. They also say they wish they would have purchased the RCBS Rock Chucker twenty years earlier. Others add that purchasing the automatic primer feeder is definitely worth it, and makes the process even faster. Many more reviews reference its strength and cast iron construction, saying it's built like a freaking tank. Possibly the best thing telling you this is a great product, is the fact that it only has 1% bad reviews. There are very few products in any industry that only have that good of a rating. Simple design makes it easy for anybody to use, even for beginners. Comes with a tray for spent primers. This makes clean-up a breeze. Every part is made of high-quality metals. If you're new to reloading, the RCBS Rock Chucker Supreme is probably one of the first products you stumbled upon during your search. With many products, the first one you see is often the one that's most advertised. In the case of this press though, the reason is that it's the best. In fact you're encouraged to look around and check out other products. In the end, I guarantee you'll come right back to where you started. This is the absolute best deal you’ll get for your money. No other single stage press can offer the Rock Chucker’s quality build and intelligent design. You’ll find some cheaper competitors that look similar. But, you’ll find yourself exerting twice the labor to press each bullet and you will have to handle the casing itself many more times. You'll also have a harder time trying to fit and press a large caliber round. The ease with which each casing is pressed with the Rock Chucker Supreme is unparalleled. With the comfortable handle, and it’s mechanical advantage, every round comes out like the shake of a hand. This requires you to handle the round itself only twice; once to set the case, and once to remove it after pressing. You won’t ever have to worry about casings falling out of the press and spilling gunpowder on your floor again. It's highly recommended that you purchase the accompanying RCBS Automatic Primer Feed. It is a hollow tube that slides right into your primary arm and can hold over fifty primers. Primers are small and can be a pain to have to insert right side up with your fingertips. The primer feed automates the process by automatically dropping a new primer from the tube onto your press. All you have to handle is the casing. Finally, pick up a few different sizes of die to work with. They're relatively inexpensive, and will fully complete your package. Even if you only plan on pressing .270's, you're guaranteed to have a buddy come begging for you to let him press some of his own different sized cases. Looking for the perfect single stage reloading press can be difficult with all the competitors on the market. Each company has their own set of standards. Some are exceptionally high and others abysmally low. Anybody who's done a fair amount of reloading can tell you (angrily cursing throughout the story) about the low-quality presses they've had, and the gunpowder they've wasted as a result. The Rock Chucker Supreme is one of the best-reviewed presses on the market and has been for decades. It's likely your grandparents may have even had one! It's a household product for many reloaders, will beat any other press at the same price, and beat many more that are twice as expensive.